Brilliant Venus reaches its greatest eastern elongation on June 9th, and will be prominent in the western sky for the next month. Look for the brightest thing in the west after sunset, and you’ll be looking at Venus. When a planet reaches greatest elongation, that means it appears as far from the Sun as it can. This only happens with planets that orbit closer to the Sun than we do (i.e., Venus and Mercury). If you watch Venus over a period of time, you’ll see it move back and forth to either side of the Sun. What you’re seeing is its orbit around the Sun from an outside point of view. 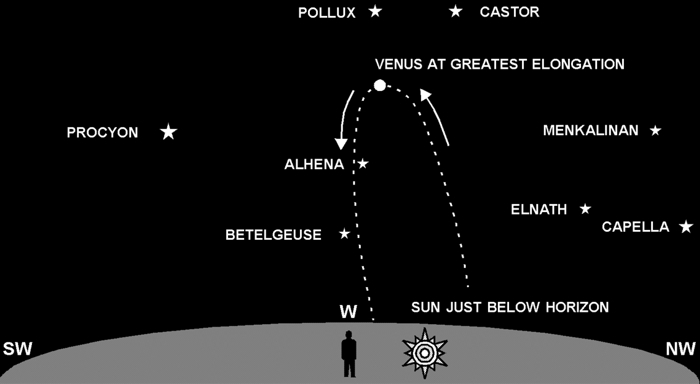 At the point of greatest elongation, Venus will be 48° from the Sun and near the brightest in its 1.6 year cycle. It will, in fact, be the brightest object in the sky (after the Sun and Moon). Venus ranks high on the list of “strange lights” reported to air and police authorities, and was once fired on by a temporarily disoriented fighter pilot.